It was truly an extra-special Christmas for some of the students of SFAS as their sponsors sent Christmas gifts to them. From school supplies to school bags to personal items (e.g. shirt, sandals, hair accessories) to bags of groceries! Some wrapped the gifts themselves. Some even mailed the gifts to the children. It was such my pleasure as I gave each child their gifts! I sure felt like SANTA ... thank you for all of you who remembered your "adopted child" this Christmas season! 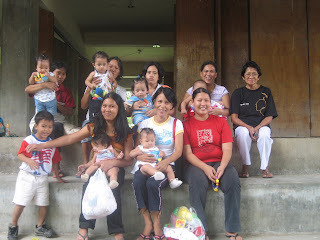 The Tapulanga Foundation started a new program last October 2007 called the Infant Feeding Program. As the name suggests, we provide FREE formula milk to farm children ages 4 months old to 2 years old. Our first beneficiaries are the following: Ruby Aberia, Crisna Macahilig, Richard Buensuceso, Loreto Ferreras III, Cedric Macahilig, Geop Antolo and Nasel Montillano. Mothers (who can) still breastfeed and we just provide additional milk. The foundation noticed most of the kids coming from the farm did poorly in school. Adequate milk during the first two years of a child may be a factor in one's intellectual capacity. For the holidays, the foundation shared some used baby clothes and toys to these 7 babies.